World Cafe's Best Music Of 2018 Playlist : World Cafe Enjoy listening to this mix of World Cafe's favorite sounds of the year, picked by the show's entire staff. 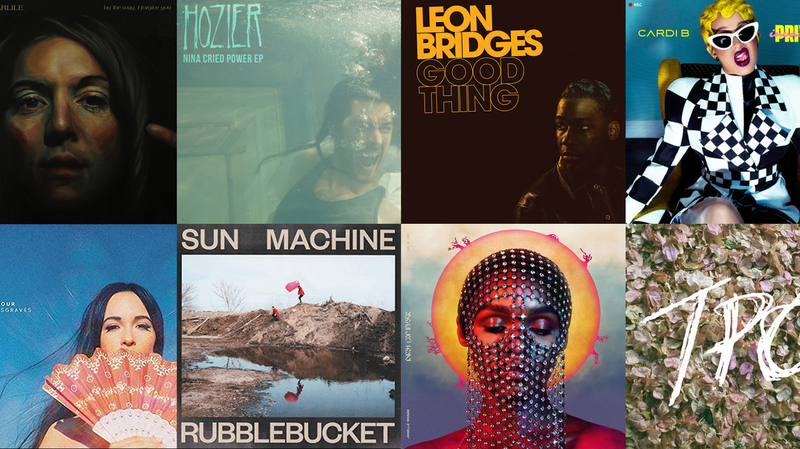 Some of the albums featured on World Cafe's Best of 2018 Playlist. Back in the day, morning radio programs would take all the week's bits, interviews, and wacky phone pranks, and build a brand-new show out of those parts. They'd call it "The Best of...whatever" But it really wasn't 'best of.' It was 'more of.' If you didn't like Sparky's Morning Playhouse, you'd probably hate The Best of Sparky's Morning Playhouse. So really, I'm terrified of calling this playlist we've assembled World Cafe's Best of 2018 Playlist" but it's probably got a little bit more sizzle than Here's a Bunch of Songs That Mean A Lot To The World Cafe Staff In 2018. There are a lot of folks behind the scenes at World Cafe whose voice you don't hear, but their presence is unmistakable. Let's roll through the office for a moment to highlight some of those folks. For starters, our executive producer, Bruce Warren, is often blasting something from his office in the morning when I get in. The loudest it ever got was either Drake's "Scorpion" or Leon Bridges' "Good Thing." I didn't bring a decibel meter. Producer John Myers is not blasting hip-hop at his desk across from mine. He is calmly, reflectively listening to (I'm guessing here) John Prine's "When I Get to Heaven," or perhaps Ruston Kelly's "Dying Star." Kimberly Junod, our senior producer, did the sensible thing and took a few days off before the holiday, so she is not sitting at her desk, but I can assure you her love of Young Fathers' "Cocoa Sugar" is for real, not to mention Mary Gauthier's "Brothers." Somehow line producer Will Loftus got the corner office cube, and as a result, we've placed his songs at the very end of the playlist. (Not really.) There's a lot of cool things about Will, but my favorite is that he and his dad went on a road trip listening to the entire collection of The White Album outtakes, demos, and remixes. Finally, there is our host and fearless leader, Talia Schlanger, who not only brightened my year with her guidance, passion and wisdom, but also introduced me to some of her favorite artists, including Christine and The Queens and Bonjay. Thanks for sharing some of your time with us in 2018. Enjoy your holiday, rest up, and we'll see you in 2019 for a world of new music — some might even say the best of it.